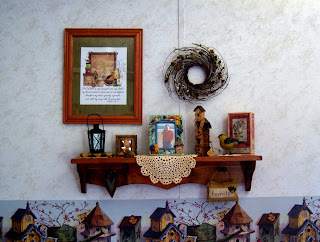 A man from church gave me several country looking shelves to use in my house. I decided to make a wall collage with one of them and made a primitive print to match. and word art from Papercraft Memories. I also painted the cream mat green so as to match the print better. 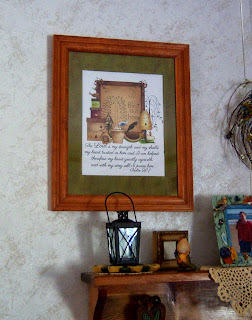 It looks wonderful and I really like the framed print - it adds the perfect touch. Such a wonderful homey style! Love the framed image you've used and the great border under your shelf! Such a nice gesture to give you those. You made such a lovely collage. I love the birdhouse border!! Your home looks like such a comfy place, and how inviting!